Include printed copies of the curriculum guide ($12.00 each)? Playkit and Curriculum were developed in collaboration with the Mass Audubon Drumlin Farm Wildlife Sanctuary, Linda Booth Sweeney and the Creative Learning Exchange. 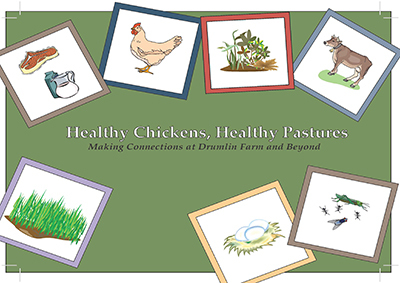 This Playkit, Healthy Chickens, Healthy Pastures, is a game to help students think deliberately about living systems in a farm setting and give students a mental framework to take home and apply in other contexts. Through this game, students explore the hidden interconnections and dynamics surrounding the 'Egg Mobile', a portable chicken coop designed for sustainable farming at Drumlin Farm in Lincoln, MA. Students will answer the question: What's the connection between the Egg Mobile and a healthy pasture? The eight-page Playkit contains everything you need in order to play the Healthy Chickens, Healthy Pastures, "Making Connections" game; this includes a contextual introduction for playing the game, instructions for playing, and a set of Wikki Stix that can be pressed onto accompanying cards to represent causal connections. Use this game to encourage your students to look for connections within the pasture, to see the people, land, and wildlife in and around farms, not as a set of interesting but disconnected parts, but as components of vibrant, living systems. We created a Playkit curriculum guide to use with groups of students to help them think deliberately about living systems in a farm setting and to give them a mental framework to apply in other contexts. Through the discussions, system mapping activities, and games in this unit, students will explore the interconnections and dynamics surrounding the 'Egg Mobile'. Concepts such as feedback loops, time horizon, and stocks/flows are illustrated through a study of the relationships between elements of a farm pasture: chickens, cows, soil, plants, manure, etc. The unit can include outdoor exploration if you have access to a local farm that raises chickens, or you can bring the farm into your classroom using photos, videos and the Internet.